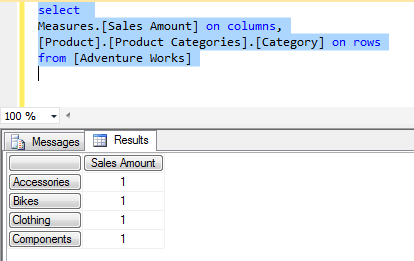 So usually when I want to test an MDX expression in SSMS I'll write a query with a "WITH MEMBER…" clause to create a query scope calculated measure. But sometimes you may want to test a scoped assignment before putting it in your cube script. The following steps show you how to do this. 3. 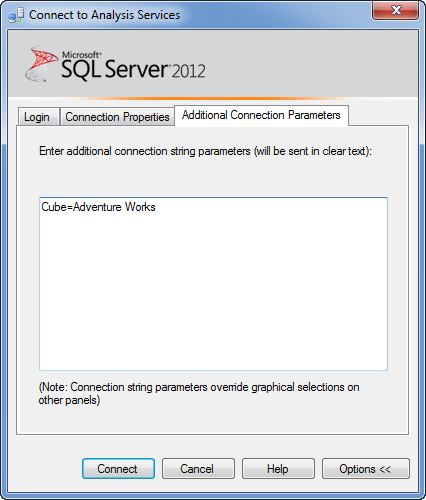 Then under the "Additional Connection Properties" tab you need to add a "Cube=" parameter with the name of the cube that you wish to apply the scope to. So we can now write a normal MDX query against our cube to test that everything is working correctly. After running the 3 separate statements one at a time we can then run our original query again to see the affects of our scope assignment. Note that this is a session based assignment which will only be visible to queries run from the same session. 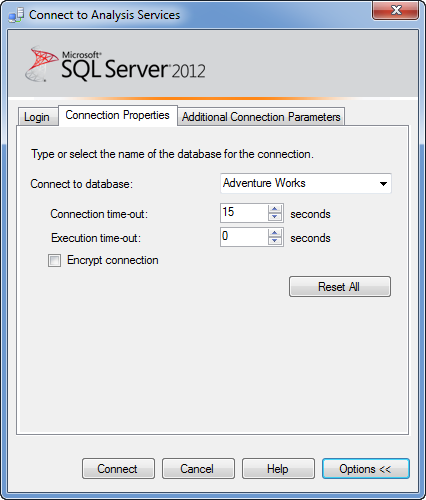 As soon as you close this session the temporary assignment will disappear If you open another MDX window or connect using Excel you will not see the affects of the temporary scope statement unless you use the "SessionID" parameter on the connection string (or in the "Additional Connection Parameters" for SSMS). Good post! I haven't used this stuff since the MDX Script Performance Analyzer, and that was a long time ago. you can use GO in between. I want to create a report in BIDS(Business Intelligence Business Studio). 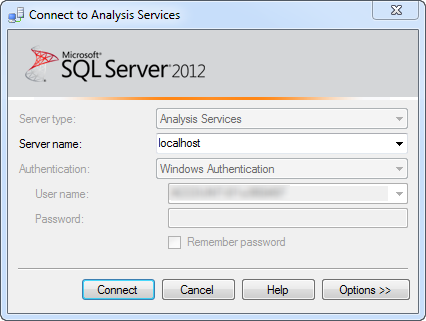 I write a query in SSMS which is running smoothly in SSMS 2012. But when I try to execute the same query in Visual Studio 2010 BIDS it shows an error like "The query cannot be prepared: The query must have at least one axis. The first axis of the query should not have multiple hierarchies, nor should it reference any dimension other than the Measures dimension..
What will be the solution for it. The solution is to either switch the query to DMX mode. Or change to using an OLEDB connection. 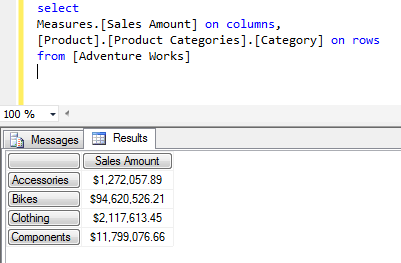 If you use the standard Analysis Services provider in SSRS it will try to force you to only have Measures on the columns.